These stretch mark remedies are not only effective but also completely natural. This article covers how to prevent stretch marks and how to heal and fade ones you may already have with natural ingredients and proper nutrition. What are stretch marks and how do you get them? Scroll to the bottom of page to view recommended stretch mark treatments. Stretch marks can result from a sudden weight gain or growth spurt and of course as we all know or have heard, pregnancy is a big culprit. They appear as reddish purple lines on the body that eventually fade to a glossy white. This is because when our skin stretches quickly the connective tissue in our skin breaks down, damaging it. These lines can make some of us very self conscious, and sometimes they can really effect our self esteem. Although you cannot get rid of them completely without some sort of surgery, the good news is you can drastically fade stretch marks with natural ingredients that are good for your skin and your health. The trick is to nourish your skin from the outside and the inside. By using natural stretch mark remedies that provide nourishment for your skin, you are giving it the building blocks to heal and regenerate itself and you will in turn get the best results. Natural stretch mark remedies are not only the safest, but they are also the most effective. First lets cover what your skin requires from the inside. If you know that you may be at risk of getting stretch marks (ie. pregnancy) there are steps you can take to prevent those unsightly lines from appearing. If you already have stretch marks these natural stretch mark remedies will not only prevent any new ones from forming, but they will help heal and fade the ones you may already have. This section is for you, regardless if have stretch marks already, or don't and are trying to prevent them. Of course a healthy balanced diet, exercise and plenty of water play a big part in preventing stretch marks. Providing nutrients that your skin loves with a healthy balanced diet plays a very important part in preventing stretch marks. Stretch marks are far more likely especially if your diet is lacking in Vitamin A and Vitamin C.
Try to include foods that are rich in Vitamin A, E, C, and silica. These all provide your skin with the nutrients it needs to form collagen and help strengthen your skin's connective tissues. Both of these things help to prevent stretch marks. Below are foods that you can include in a healthy, balanced diet. Please do not overload on certain foods thinking that you "for sure" won't get any stretch marks now. Everybody needs a healthy balanced diet. Exercise is another step you can take to prevent stretch marks. Even something as simple as taking a walk three times a week can make a huge difference. Being active keeps your body strong and healthy and in turn keeps your skin strong and healthy. If your skin is producing collagen effectively, and your skin's connective tissues are strong you will be far less likely to get stretch marks. Nature has once again provided us with everything we need to put on our skin to prevent stretchmarks or to heal and fade already existing ones. Below is list of ingredients that you should look for when purchasing natural skin care products. If you would like to make your own natural stretch mark remedies these ingredients can also be used in your own skin care recipes. All of these ingredients are awesome moisturizers for anybody's skin but they are especially good for treating or preventing stretch marks. Aloe Vera Aloe Vera is mostly known for it's use on burns, but it is just as effective on stretch marks. It moisturizes, soothes and accelerates healing. Almond Oil A good anti inflammatory that is great for damaged skin. Avocado Oil This oil rejuvenates, regenerates and increases collagen production. Carrot Seed Oil Carrot seed oil is extremely nourishing and improves skin's elasticity. Cocoa Butter Cocoa Butter smells yummy, is an excellent moisturizer and helps build you skin's elasticity which makes it a very effective treatment for healing and preventing stretch marks. Coconut Oil Good for healing damaged skin. Frankensence Oil Good for healing and fading scars and stretch marks. Jojoba Oil Another excellent moisturizer that soothes and is good at fighting stretch marks. Lavender Oil Lavender is a good skin balancer and has wonderful healing properties. Neroli Oil This oil stimulates the growth of new skin cells making it a good choice whether you are trying to get rid of, or prevent stretch marks. Neroli oil is a highly relaxing aromatherapy oil so it is awesome to put a few drops of this in your bath. Olive Oil Eat it or wear it, this oil is good for you and your skin. A very effective moisturizer with excellent healing properties. Shea Butter Although it does not smell as good as cocoa butter, shea butter accelerates healing, improves elasticity and is equally as effective in fighting and fading stretch marks. Vitamin E Good for healing damaged skin and moisturizing. 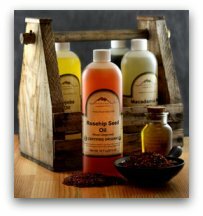 Visit Mountain Rose Herbs for a large selection of essential oils, butters, and many more natural skin care ingredients. Follow these guidelines and they can either prevent or help heal and fade stretch marks. Be realistic when approaching your natural stretch mark remedies. As brought out earlier the only way to completely get rid of stretch marks will involve some sort of surgery. These natural skin remedies will give your skin everything it needs to be strong and healthy and in turn will prevent or dramatically improve the looks of stretch marks over time.